My first walks through the campo north of the house found me looking down: fragments of tiles poking through the sand. 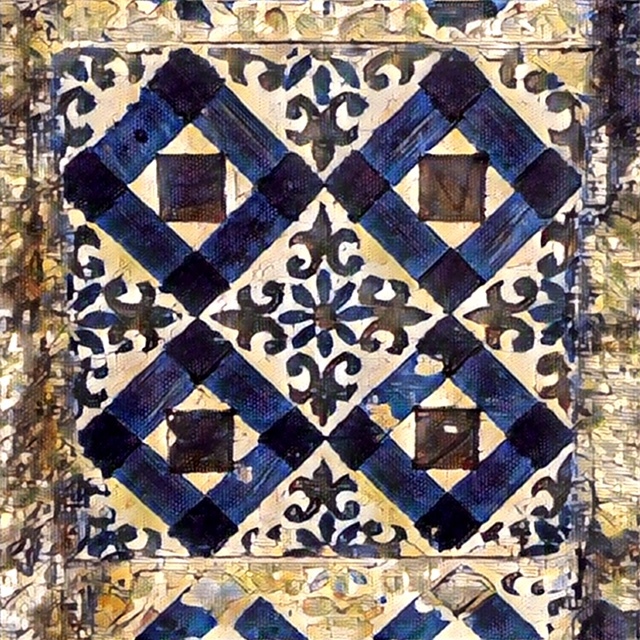 Pieces of the azulejos that adorn walls, buildings, and pottery throughout Portugal. I collected a couple and rolled them around in my hand like dice. Not a week later, on another exploration with the dogs, I looked for one of the trails that must criss-cross the natural park bordering our town. We cut through one of the vacant lots, stumbling along the loose dune-like track ‘til we came to a road–and a line of trash bins. While the pups sniffed through the supermercado, I was drawn to a pile of construction rubbish nearby. Sticking out of the white ceramic and terra-cotta shards were streaks of color, a handful of picture tiles, broken and discarded during someone’s remodeling project. One after the other, I searched through them. “Madeira” said one piece; “Portugal” on another. Then, the real find: a triangle of a Portuguese trader, with the hallmark red cross on its sails. I tucked it into my pocket, and headed further into the campo. Over those first weeks, on every walk, I made my way around the town by following the beautiful street plaques leaning on every corner. Some were intact, but others reduced to rubble, waiting for a day of repair…that day never came, save in one case, that I saw. Otherwise, the plaques have tilted and sunk over the years, sometimes only giving a rough estimate of which street (and direction) they marked. A sense of play and curiosity while navigating Portugal; apparently, a must! The next month, during my mom’s first visit to us, we drove up the hill to the palace and gardens at Monserrate. The calla lilies shone blazing white amidst the emerald green of the waterfalls and pathways, entrancing us. Though others may have been charmed by the ostentatious, bedazzled palace, I found another treasure while exploring the grounds below. We searched for the kitchens, but instead we found the tiles left behind, those blue and white and golden vintage walls of them, abandoned to be consumed by moss. To look at these vignettes together…it’s easy to find what drew me into this land. The new, the modern, the dynamic–those are assuredly parts of Portugal I appreciate, and the parts that will propel it forward. But the soul of the country rests in its pieces of tile, its broken azulejos, and the stories, flavors, and textures they belie. Portugal’s compelling magic captured in the tiles.